Dubai, UAE – 9th October 2018: In the post-war years of the late 1940s and 1950s, aerodynamic principles were just beginning to take root in the field of automotive design. The boxy, carriage-like shapes of previous decades were melting into something more streamlined. At the same time, curvilinear forms became more prominent, carrying the immediate promise of power and speed. The sophisticated computer modelling and wind-tunnel technology we have today were far-off dreams at that time – designers were guided more by their aesthetic sense than by any scientific precepts. Presenting Horological Machine N°9 ‘Flow', inspired by the dynamic profiles of automotive and aviation mid-century design. the ‘Road' edition has a rose gold movement and a classic speedometer-style dial. Horological Machine N°9 ‘Flow' is audacious in its design, not simply because of its unconventional form, but because of the extremes to which it takes this form. Mould-breaking, transgressive case shapes are nothing new to the MB&F Horological Machine collection, but HM9 has rejected all limits. Its extreme curves and acute angles required new manufacturing standards and techniques to obtain a complete milled and finished case. Horological Machine N°9 ‘Flow' was not designed with current manufacturing techniques in mind. Its curves are too pronounced and its finishing requirements too strict. The dramatic geometry of Horological Machine N°9 ‘Flow' could only be supported by equally dramatic contrasts of finished surface, so manufacturing conventions evolved to meet the demands of HM9. Because of the proportions of the curves on the HM9 case, it was essential to control the overall size. Horological Machine N°9 ‘Flow' measures 57mm at its widest point and requires a highly compact yet robust engine. Perhaps the most interesting aspect of HM9 is how its exuberant, expressive design is possible only because of the restraint and spatial efficiency of its engine. The result of three years of development, the HM9 engine was created entirely in-house, with the accumulated experience that came with MB&F's 13 years in existence (in 2018) and previous 14 different movements. HM9 further calls out the MB&F Legacy Machine collection with the curved arms anchoring its balances, their polished steel finish contrasting vividly with the movement bridges. There are two versions of the HM9 engine, one with a dark NAC coating and another in matte rose gold. Air edition with darkened NAC movement and aviation-style dial. In 2015, MB&F celebrated its 10th anniversary – and what a decade it was for the world's first ever horological concept laboratory: 10 years of hyper-creativity; 11 remarkable calibres forming the base of the critically acclaimed Horological Machines and Legacy Machines for which MB&F has become renowned. In 2007, MB&F unveiled its first Horological Machine, HM1. HM1's sculptured, three-dimensional case and beautifully finished engine (movement) set the standard for the idiosyncratic Horological Machines that have followed: HM2, HM3, HM4, HM5, HM6, HM7, HM8 and HMX – all Machines that tell the time, rather than Machines to tell the time. As well as Horological and Legacy Machines, MB&F has created space-age MusicMachines (1, 2 and 3) in collaboration with music box specialist Reuge; and with L'Epée 1839, unusual clocks in the form of a space station (Starfleet Machine), a rocket (Destination Moon), a spider (Arachnophobia), an octopus (Octopod) and three robot clocks (Melchior, Sherman, and Balthazar) – as well as a mechanical weather station (The Fifth Element). In 2016, MB&F and Caran d'Ache created a mechanical rocket-pen called Astrograph. And there have been distinguished accolades reminding us of the innovative nature of MB&F's journey so far. To name a few, there have been no less than 4 Grand Prix awards from the famous Grand Prix d'Horlogerie de Genève: in 2016, LM Perpetual won the Grand Prix for Best Calendar Watch; in 2012, Legacy Machine No.1 was awarded the Public Prize (voted for by horology fans) and the Best Men's Watch Prize (voted for by the professional jury). 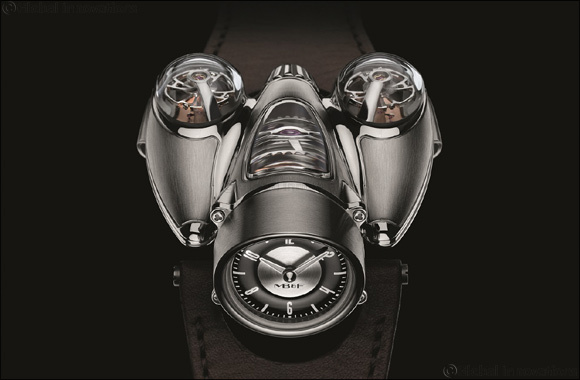 In 2010, MB&F won Best Concept and Design Watch for the HM4 Thunderbolt. In 2015 MB&F received a Red Dot: Best of the Best award – the top prize at the international Red Dot Awards – for the HM6 Space Pirate.